Welcome to our Singapore Massage School page, here you can check the available dates for our massage courses in Singapore and book online. Train with us in the dynamic and cosmopolitan city of Singapore to work as a Raynor Massage Practitioner. In Singapore we usually offer both our Certificate and Diploma intensive massage courses so you can train to work in just 5 or 10 days. Taking the Diploma course in Singapore also qualifies you to attend our 6 day Advanced Diploma Course. However we don’t have any courses scheduled for Singapore during 2017 but you can request us to come and teach a massage course in Singapore. We usually require a minimum of 4 people. See group packages for more details. Also you can email us and put your name down for any future Raynor massage courses in Singapore. We also recommend you come to one of our courses in Australia or New Zealand. We have courses coming up in Sydney, Melbourne, Perth, the Sunshine Coast and Hanmer Springs in New Zealand. Raynor Massage is a massage style developed by Naturopath Brandon Raynor and has become known as one of the most powerful deep tissue styles of massage in the world. This massage not only incorporates standard deep tissue massage techniques but also elements of acupressure, shiatsu massage, Thai massage, Hawaiian massage, Swedish massage and Ayurvedic massage as well as other Naturopathic techniques. 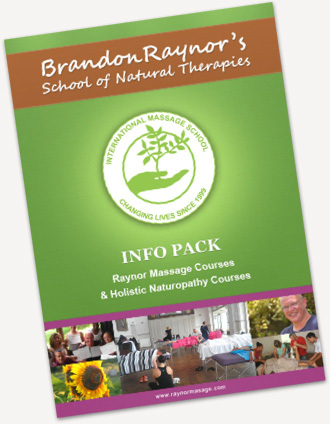 How are Raynor Massage courses different? Our massage courses were developed with the learner in mind by a therapist who has been practicing in the field for many years. They are hands-on and individualized courses, designed to get you massaging from day one without spending time on theory that you never use. In our massage courses you will learn to develop your sense of touch so as to detect muscle tension and blocked energy in its many forms, layers and channels in the individual patient’s body. You will learn to trace problems to their source rather than just treating them locally. For more information please see the articles What is Raynor massage, and What is Chi. We train the therapist to work with the whole body and to work to restore it to wellness, you can read more of this in the article What is Health. A client may be getting headaches but the real problem with that person may be tightness in their hands which travels up the arms into the neck and into the head causing headaches. We will teach you to get to the source of this muscle tension and relieve it. This heightened sense of touch, and knowledge of how the body functions in a holistic manner, as well as the knowledge of a variety of techniques from the worlds’ most renowned massage styles, will give you the ability to break up and release this muscle tension from its roots. A massage that can actually release the tension and frees the body’s subtle energies on this deepest level works wonders with emotional and physical ailments, as many emotional problems actually have physical interaction. Our cutting edge approach to therapeutic massage is one of the best remedies to treat anxiety, depression, deep seated emotional disturbances, stress and can assist in healing back pain, various injuries, repetitive strain injury, pinched nerves, sciatica, muscular spasms, aches, pain, stiffness, migraines, arthritis, scoliosis, and some forms of immobility. Please click here to read some of the most Frequently Asked Questions by potential students. If you have others please use the Contact Us Form to email your questions and we would be happy to answer them for you. Read testimonials from students who have already completed our courses.